Update: Good news for shared governance. Going on now, room 402 Alumni Center. I’ll do a little live-blogging. Kyr introduces them by noting that this is the first time in 4 years we’ve had a President or a Provost willing to meet with the Senate Exec. Discussion is about how to get faculty/staff student input into developing goals, and a strategic plan for achieving them. “Competitive Excellence” Plan docs are here. Chuck Triplett then discusses how he’s going review and revise all the policies we inherited from his former employer, OUS. He’s proposing completely rewriting UO’s “policy on policies”, now to be run by a “Policy Advisory Committee”. His new procedure contains no mention of the UO Senate. Zippo. Under the current policy on policies, the Senate has considerable power. I’m imagining there will be a few questions! Q: Where are we out of compliance? Who can come after us? CT: Our academic accreditors, who insisted on the policy library. Hubin: We will *not* be subject to the planned accreditation review in 2017. It will be postponed due to the transition. JB: Where is the Senate in your flow chart? Our Constitution is quite clear on the Senate’s role. CT: We’ve identified the policies that involve academic matters as commonly understood. JB: That’s nice, but the Senate Exec gets to decide, not you. I want the Senate Exec written into the process. RS: Yes. Coltrane: Lots of policies, we need to do some triage. PAC will do much of it. Suggests Margie Paris as a faculty member. [?]. Bronet: PAC will be Senate led. JB: Where’s the list of policies? CT: I’ll send it to you, but it’s just titles. Coltrane: BTW, We just discovered we never adopted the UO PD complaint and grievance procedure. It will come your way soon. Pretty good session. Coltrane leaves. Era of good feelings continues. Next, Carol Stabile on Sexual Violence Task Force. 1) Office of Gender Equity, headed by a VP. Report will explain what resources this would require. [Very expensive. Check the budget and staffing of the VP for Equity and Diversity to get some idea]. 2) Senate Committee on Sexual Violence. 3) Support Campus Climate Survey – need that information. Need to assess what programs work, what don’t. 4) Wants to postpone Sorority/Fraternity Rush from fall to winter. 5) Improved implementation. End mandatory reporting. Audit Penny Daugherty’s AAEO office, there have been many complaints. Revise policy on sexual/romantic relationships between faculty and students. Develop proposals for mandatory courses. Funds for SWAT and women’s self defense. Track problems with sexual assaults involving Fraternity and Social Life. No data on which houses are on probation, etc. Let Ombuds office be confidential. Restart Committee on Alcohol and Drugs. More Title IX training for greek life, athletics. New booklet. MOU’s with SAS, Womenspace, EPD. BH: Why nothing about athletics. This is were all the trouble started? CS: They wouldn’t talk to us. We had no cooperation from them. Locked down tight. BH: Seems like that makes it more important to have recommendations. RK: Yes. JF: Yes, very bad for UO reputation. JB: Make recommendations about athletics. Put them on the spot. Long discussion about how to deal with the problem of the uncooperative athletics department and the PAGIA. New draft here. No, don’t click on that link. Trust me, it’s fine. Let’s all move on and hope Bronet posts some of Shelton’s secret budget model docs soon. (1) As a UO retiree and graduate (Ph.D., M.A. ), I was dismayed by this draft statement. Is the UO still a public university? The only mention, under “Lead,” is to declare that it is a “preeminent public residential research university.” Similarly, under “Define,” we find it placed “in Oregon, the West, on the Pacific Rim, and the world.” Geographically correct (though the syntax needs work), but there is no indication in these packed-together phrases that the university aspires to serve Oregon, its population, or its students in any real sense. … (5) I don’t agree with those who’ve said that the university’s declared mission is unimportant. To me, at least, it matters that the university have recognizable aims, clearly stated. The mission statement is a public document. If I were on the faculty of the university, I’d wonder what this statement demanded of me, and whether I or my department might someday be publicly judged by it. But probably all for naught, the Trustees are scheduled to vote this week, and they’ve put the original text in the docket. What does “sustainability”—a trendy word I realize we feel must go in there somewhere—mean as a component part of community? (Is it still the Edison Elementary School motto (with hand motions! ): “Safe and respectful, including all learners”? Can we follow the lead of Anonymous and think about what we mean by this in a university? )How is “define” as aspect of “vision”? What does it mean to “seek definition”? What does the phrase mean: “seek definition through the recognition”? Can one do that? Does it clarify anything to say “seek definition through the recognition of the quality of…”? Someone needs to fix the punctuation to make the next part flow the way it seems to be intended: “We seek definition through the recognition of the aspiration, passions, and success of our students”? Our students apparently have a singular aspiration and plural passions. Tagged academic plan, Charles Triplett, Frances Bronet, Scott Coltrane. Bookmark the permalink. You stopped at the right place. Pretty sure I heard strains of “Glory, glory hallelujah…” while reading this first missive from the acting provost. of this BS. Show us the money, Bronet. I see that in all comm you have decided to employ “aspirational”. Not a word that works w/faculty constituency. Please stop using it. What do you mean by “the West”? The western world? The western US? And for what other reason than getting students did you use the Pacific Rim? The UO is engaged with countries all over the world. Not enough emphasis on research. That’s what a major research university does. I have no clue what “progressiveness” means. Get rid of it. What does “definition” mean in this statement? Finally, NO mission statement should be more than one or two sentences long. E.g., The UO seeks to discover, educate, and protect. As a research university our faculty and staff are dedicated to research, to educating the next generation of leaders, and to protecting the rights of all to think and express themselves freely. The definition clause is a mess. One would expect it to address the academic process of defining problems, concepts, etc. but instead it just pleads for others to define us as excellent rather than earning it ourselves. I suggest Bronet call off the PR hacks (from the Journalism School?) who seem to be writing these drafts. She can then write one herself. Should be a simple task for a provost, even an interim one. Pretty sure it’s not the J-School. Possibly it’s from the desk of someone named something like Tober Klingon of the official communications division? Recent hire with an ax to grind? Probably Gottfredson’s speechwriter and strategic communications consultant Ann Wiens. You are literally writing this statement by committee? The definition of administrative incompetence. Tried to add my comment to the site, but haven’t seen it yet. I’m sure they are editing my edits and rewriting my rewrite. Have you seen that JH included “information” on mission statements so we could learn all about them? I really can’t take anymore of these projects…mostly because I’m so tired of the admin asking us to do their jobs. I don’t want anymore surveys to fill out unless it’s about what I want the union to bargain for in the next negotiations. I don’t want to waste my precious summer — the only concerted time I have to do research and prep classes — writing mission statements. We need these people to focus on real issues: reducing class sizes (and the number of courses); getting more research time for faculty who teach a lot so our prestige and ranking will rise as we get more work done and disseminated; fixing the damn budget model; getting the law school back on track AS A PROFESSIONAL school — not an undergrad program that siphons students from CAS and then doesn’t provide a real liberal arts degree. I could go on but I’ll stop here. 1) How is soliciting input asking people to “do their jobs”? The point of a mission statement is to be something that everyone contributes and buys into. Having the admin do it by themselves would be counterproductive to that goal and would certainly garner scorn. 2) No one’s forcing you to contribute. 3) You’re also wasting your “precious” time posting here. Go do research and get published! WTF? You gave a link to a “somewhat scholarly investigation” of mission statements by “a Hall Advisor for Wing Hall” in Vermont? An essay that would garner perhaps a C in class at UO, and that spends 20% of its space telling us how a community college in Oklahoma uses its mission statement? Please. I’ll answer Anonymous above. There’s a difference between soliciting input on a well-crafted document and circulating to the entire faculty a poorly written thing in which the most basic elements are undefined and even illogical. Yes, a smart administration writes it mostly “by themselves” and then asks for input. When faculty members are offering line edits in the comments box just to eliminate meaningless jargon and clarify the sense, you are wasting their time. I said “somewhat” scholarly and at least its some kind of analysis. What grade would you give the current mission statement? besides, given our current enormous TTF to student ratio, convince me why a mission statement for a Community College, in fact, is inappropriate? As noted, the draft mission statement is a hopeless mess of obfuscation and cliche. This is likely because, from all outward appearances, the actual mission of the University appears to be as follows: “Win the BCS football championship at any cost, while keeping the school afloat by admitting as many Californians and international students as possible.” Until outward appearances reflect loftier goals (such as educating the next generation of Oregonians), all attempts at crafting an inspirational mission statement will continue to faint in coils of meaningless jargon. Before we debate where we’re heading, how about we put the horses in front of the cart? While we are talking about words, why does Shelton call his budget system a “model”? A model is an idealization which approximates a real phenomenon. 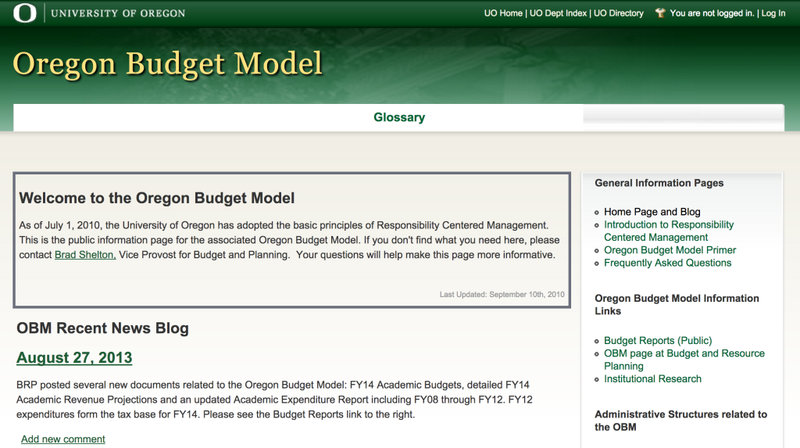 What does the budget model model? Isn’t it just an accounting system? What don’t I understand? Is the actual system by which funds are distributed around the university so poorly understood and incapable of codification that the best we can do is “model” it? It’s an idealized abstraction of the real world of JH budgeting. As with any model, certain elements have been omitted – e.g. the widely rumored millions in new subsidies for the law school. I’m sure this is done only to keep the overall depiction simple enough for us to understand. The ‘model and similar ones that preceded it did exactly what any rube off the street would have predicted. it created incentives to offer the cheapest credit courses possible, to throw open the admission gates without proportionate increases in TTF, classrooms, or offices. the union is largely a reaction to that phenomenon, the explosion in numbers of poorly paid and insecure NTTF, and inattention to legitimate concerns of faculty. The only positive innovations in the model, a little more weight on majors than just cheap lower division credit hours and transparency have been abandoned. better to just call these things information systems and require that actual allocation decisions be made in front of the wizard’s screen. the irony of millions sucked out of the units covered by the CBA and delivered to the one academic unit outside the CBA is too rich for words. Not to be cynical or anything. Yep – exactly as planned. Shelton actually told me once that of course that is how units would react but now we have a transparent economic model so that is good. He didn’t seem to care that it rewarded all the wrong behaviors. As for the irony you cite, it’s only irony if it’s true and right now it’s just a rumor on UO matters. Of course subsidies abound on this, and every, campus. Just not usually to law schools though that may be a more widespread phenomenon than in the past. I still don’t understand. A model is descriptive. What you are describing is prescriptive. Which is the “budget model”? Maybe I am just a rube off the street.